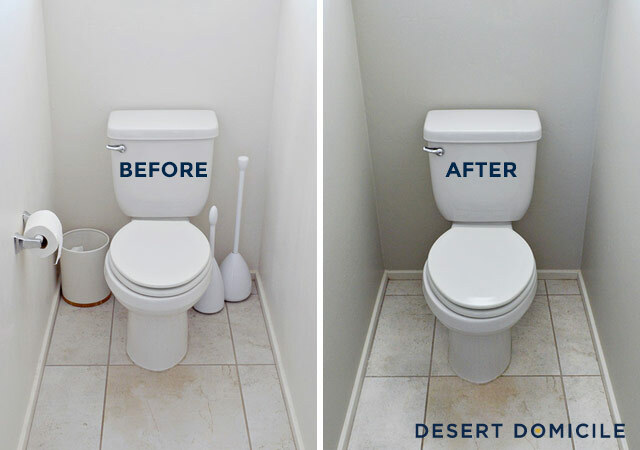 Painted Water Closet + A Giveaway! Our water closet has been painted! It's a subtle change but we love it! 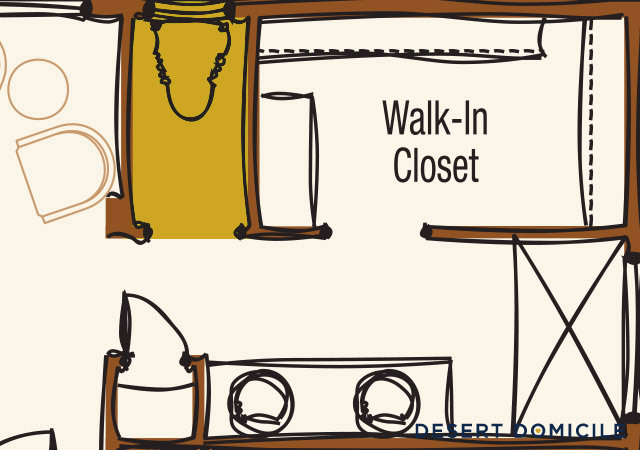 I chose a light neutral for the space because I knew that whatever color we picked would also be used in our master closet since the rooms are sort of connected via the rest of our master bathroom. 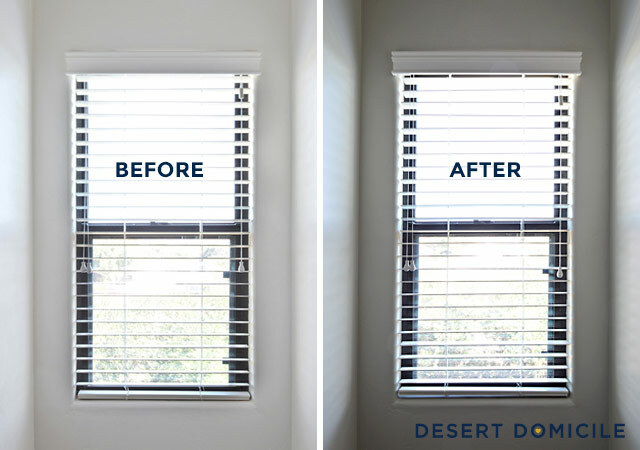 It needed to look good with the color of our master bedroom since our bedroom is open to our doorless bathroom. 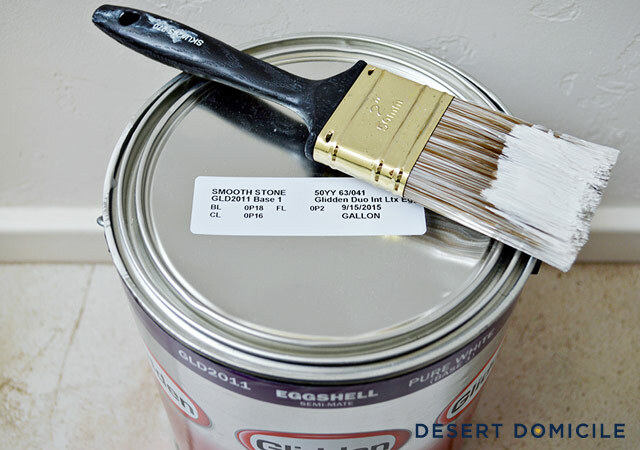 The winning color ended up being "Smooth Stone" in Glidden DUO Paint + Primer! 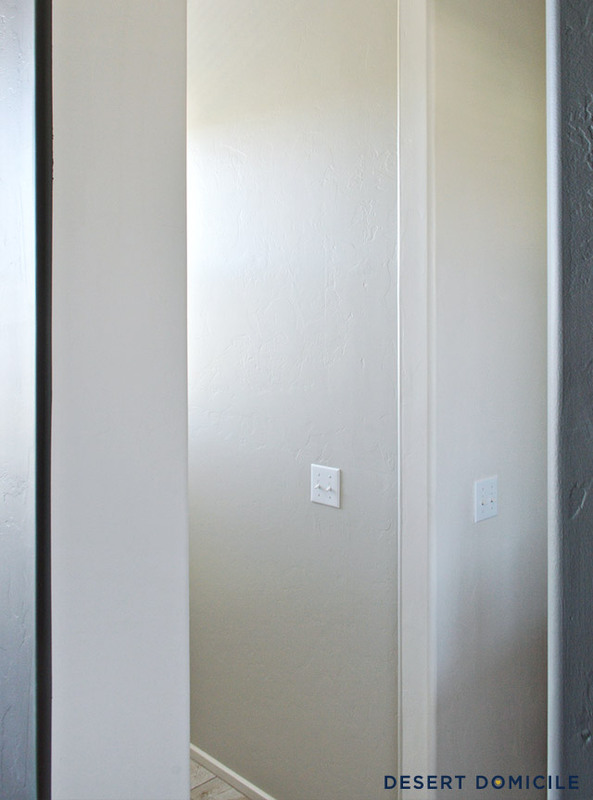 I chose Glidden®’s DUO line of paint because I wanted a paint and primer in one. 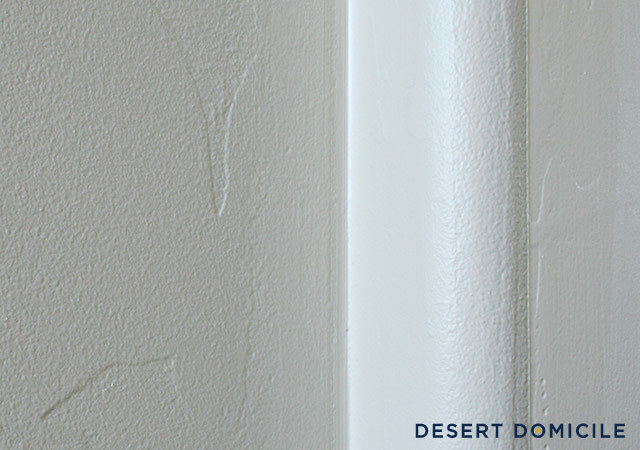 We had to patch a few holes when we removed our towel bar and toilet paper holder and in the past, when I would paint over patched areas, the areas would flash through the paint if I didn’t use a primer. 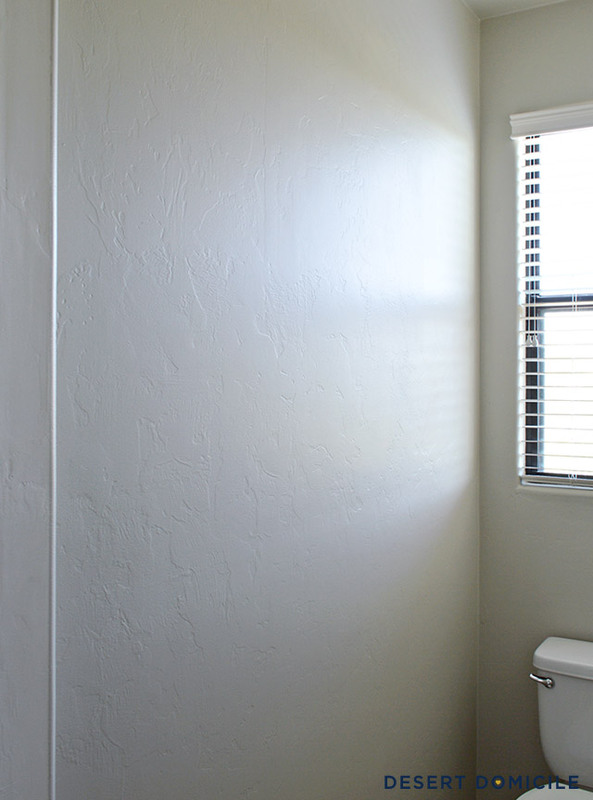 Also, I liked that the paint was Low VOC (important when you’re working in a small, tight space) and scrubbable (perfect for a bathroom)! I was a little nervous when I opened the can and saw how light the paint was. I was pleasantly surprised when I saw the paint on the wall though! The color is a bit of a chameleon. 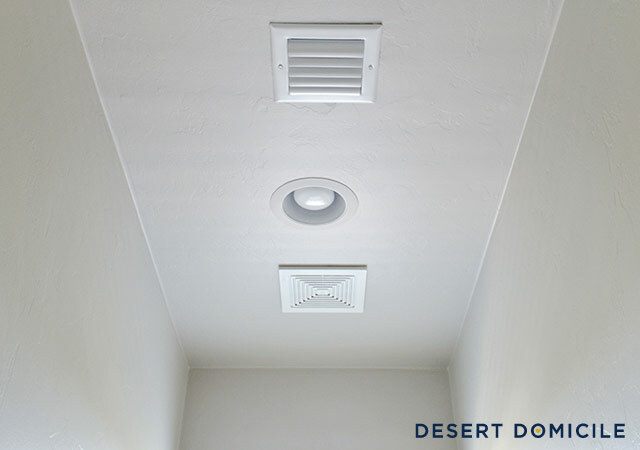 It can read gray or beige depending on the time of day. I've noticed that the color is a little cooler in the morning but it warms up in the afternoon/evening when the sun is setting over our house. It's a great gray and a perfect neutral! Painting the room was a little difficult because of the tight space. 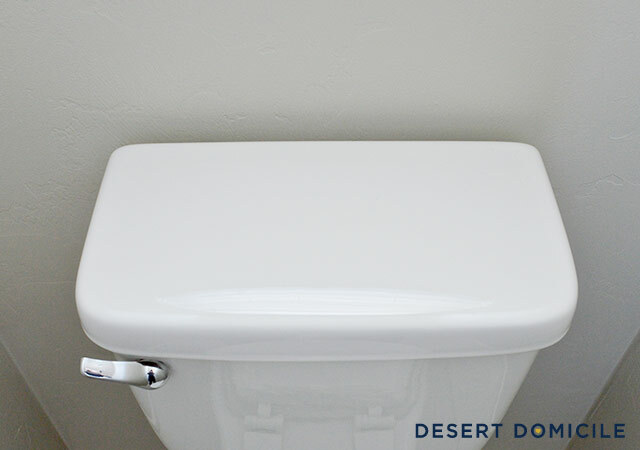 Tip: cover your toilet with plastic wrap so you don't get any paint on it when you're trying to shove your brush/roller behind it! I'm not sure if you noticed but I painted the ceiling as well! The room is so tiny (33" wide x 73" long) that leaving the ceiling unpainted meant there was going to be a hard transition from the walls to the ceiling. To me, it didn't make sense to have a break in the color or to leave the small ceiling strip unpainted so I went for it! Now it's your turn to paint! Ready for the giveaway? 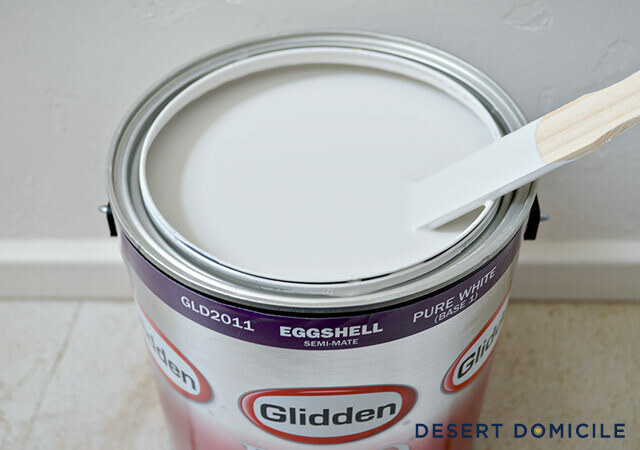 I’ve partnered with Glidden® paint to offer one lucky reader a $50 gift card to The Home Depot so you can buy yourself a gallon (or two!) of paint + any supplies you might need! 1. 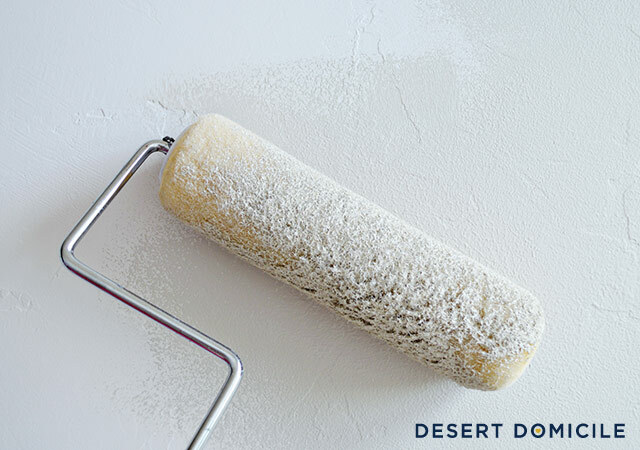 Leave a comment below telling me what your next painting project will be. 2. If you’ve used Glidden® paint before, write a review on Glidden.com here for an extra entry. This giveaway is open to U.S. residents only and ends at midnight PDT on Friday, October 2nd. The winner will be randomly selected and contacted by e-mail. Good luck! I love that you painted the ceiling!! I'm hoping my next painting project is on our kitchen cabinets....if I can get my husband to agree! it's wonderful how much paint can warm up a room! can't wait to see the progress! I painted our kitchen/dining room/hall when we first bought our house, but I think I'd like to repaint it...it just doesn't look right. Looking good! I'm hoping our next paint project is something in a new house, but if not I'd love to repaint our dining room table. I like the soft color. I want to paint my step-daughters room. I think they would love a soft blue on the ceiling and white on the walls. It would go perfect with their new tween beds! I really like the color- fresh and clean. 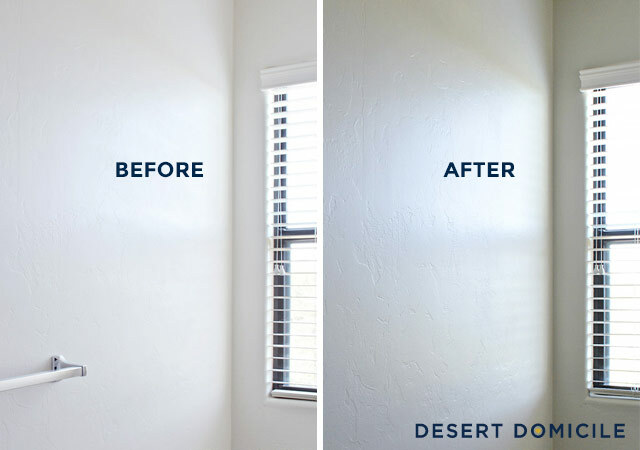 I would love to paint our master bedroom next. The room is all white and is begging for color. 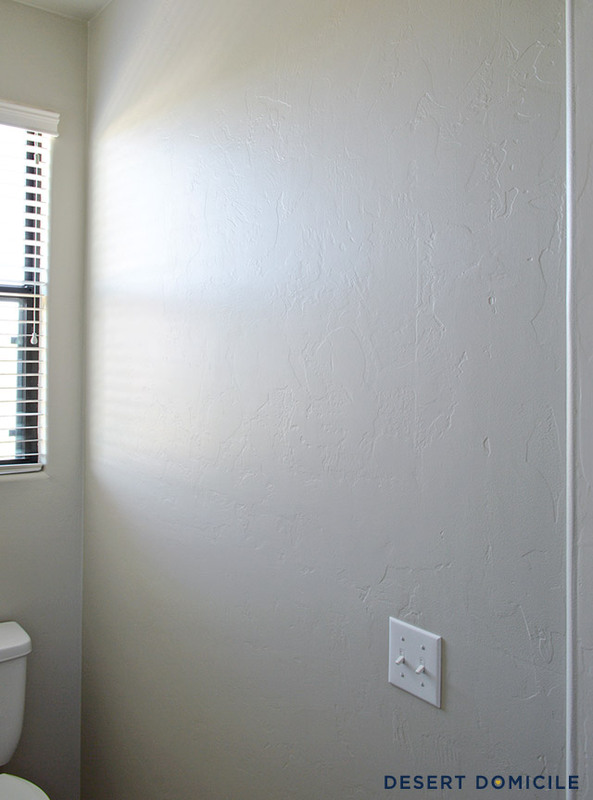 We need to paint our master bath as well! I'm glad you showed this color because I also need something that works in natural and artificial light. It looks great! Our attic bedroom is the last room in the house that needs painted (we moved in almost two years ago!). It's the biggest bedroom so I've been avoiding it, but it's a pea green and is atrocious! That will be a weekend project soon! There are many painting projects awaiting this old house, but I think first up on MY list is the master bedroom. Goodbye pink and white striped wallpaper. Hello blue walls. Our next project at the new house will definitely be a major kitchen overhaul, which will include painting our cabinets one uniform color since they're currently two completely different shades of off white! I am really itching to paint my basement! I'm thinking a deep teal? We so need some paint. Starting my daughter's room soon. I love the color you used!! Its exactly what I had in mind for our living room (the entire house needs an overhaul but the living room is first on my list!). I cannot wait to see your WC all finished! Sometimes subtle is just what you need! Up next for paint projects at our home ... Painting the trim! Everyone's fave, right? 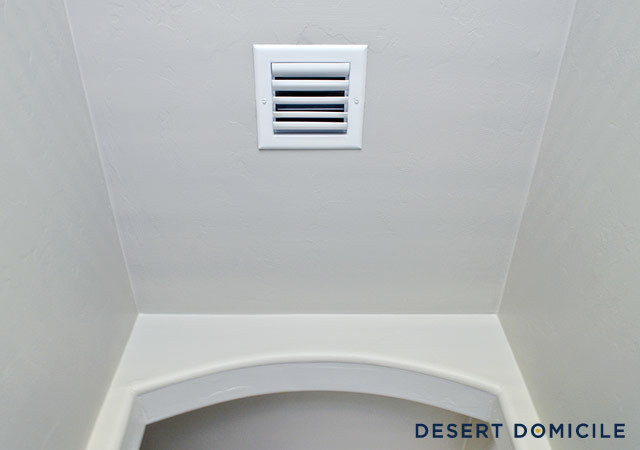 Our next project is our attic bonus room- it has angled ceilings so I think I'm going to follow your lead on painting the walls and the ceiling the same color. My teenaged daughter's bedroom needs a new look. We are planning to paint her bedroom very soon, and free paint would be just the incentive we need to get going sooner! Your petite bathroom looks refreshed and glamorous. I need to paint our living room and soon before it gets too chilly here in Chicago. Our next project will be our master bedroom. Right now it's a moody gray, but I'd like to make it lighter and brighter. I love the color. I have been looking for a greige that was nice and light. I can use this in my master bath, dinning room or on my kitchen cabinets. I just need to decide which project to start first! We're working on our living room and dining room right now, so those will be our next room painting projects! Although I just finished staining our new front door and now have to paint the trim. You did a great job! My kitchen is so overdue to be painted, including the cabinets. I would love to use Glidden paints and get it done soon!!! now that we painted the kitchen, we need to paint our hallway. it's been painted...but it's a barely there off white that only looks dirty! Genius to paint the ceiling in your W.C..Never thought of how much of a difference it'd make in a small area until seeing your pics! Definitely will keep that in mind. It's very soothing! It's a subtle but sophisticated change. I really like it! 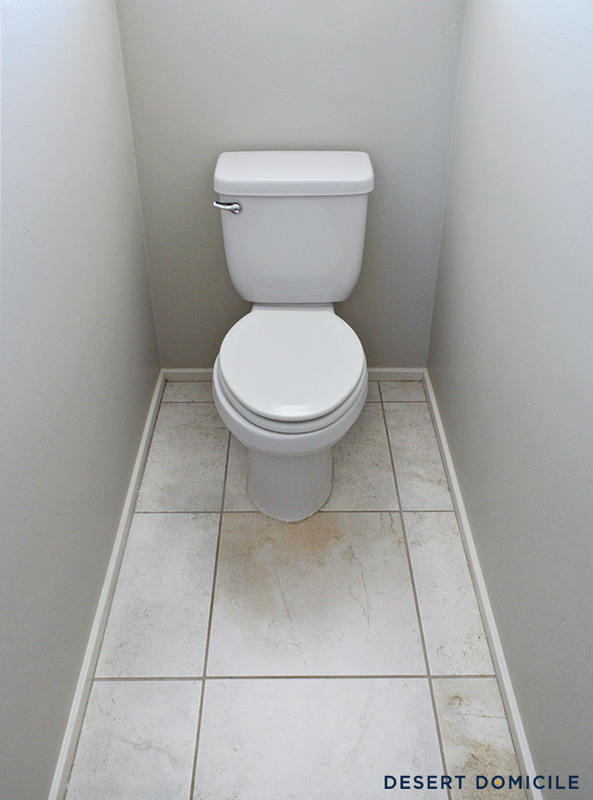 We've started a bathroom renovation and I really need a gallon or two of white and emerald green paint. Maybe I'll be the lucky winner! I'm really hoping to repaint the living room! We have an extra bedroom in our home that we are going to convert into a playroom for our kids. The first step in that process is a new coat of paint. I would like to repaint our kitchen and dining room. I just finished painting window nooks that were a hideous neon orange (yay for renting) into a deep, rich gray to match the rest of my decor. Now I am set to help my friend paint a wall in his office in his rental. 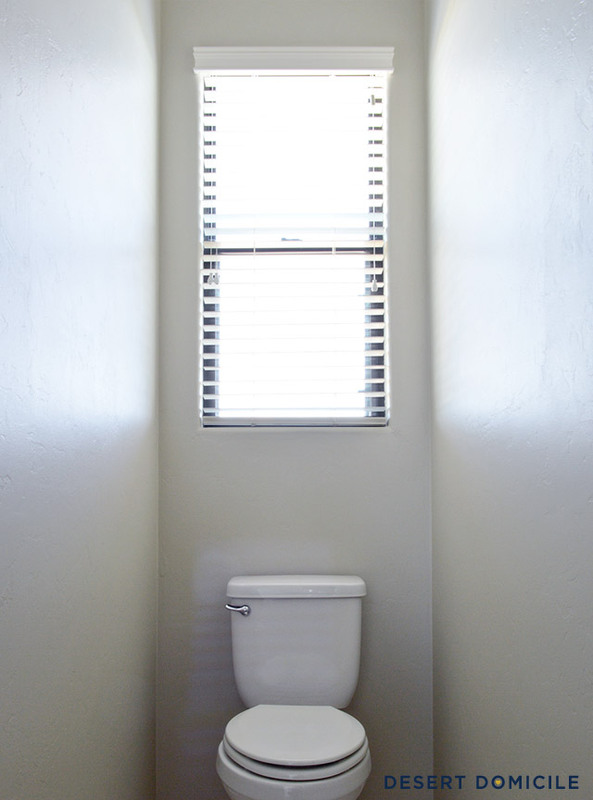 Your water closet looks really nice.